Is It Okay to Share Your Streaming Video Password? Should You Pay for Dark Web Monitoring of Your Personal Info? Two professors have just released their annual ratings of airlines. The rankings are based on objective criteria: on-time arrivals, involuntary denied boardings, mishandled baggage, and a combination of 12 customer complaint categories. Topping the list this year is Delta Airlines, while Frontier is at the bottom. See how your favorite airline ranked. There are two ways to get cheap car insurance: move to a state with lower rates, or buy from a company that tends to sell insurance for less. The latest WalletHub survey reveals both -- the companies that charge the least, and the states where car insurance rates are the lowest (and highest). Whenever you use a digital camera, whether it be the one in your smartphone or a conventional camera, each picture is encoded with a lot of identifying information. And when you post the picture online, you are sharing it with the world. This includes the date and time the picture was taken and sometimes even the GPS location. Here are ways to prevent this identifying information from being recorded. Mouse Print* -- Fly to Hawaii for $6 Roundtrip? Arby's is running a promotion today (April 15) offering to send five lucky people to Hawaii for only $6 roundtrip. You read that correctly. But before you get too excited, you've got to read the fine print as we did. 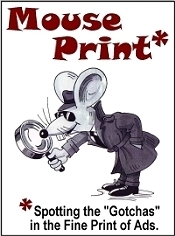 That is our Mouse Print* story this week. Some cash back credit cards give you a certain percentage back if you shop at a particular type of merchant, such as grocery stores. For example, Chase Freedom is offering 5% back this quarter at supermarkets. So if you buy your groceries at Walmart or Target, you get the 5%, right? Not so fast. You won't because those stores are not categorized by credit card issuers as grocery stores. See how you can check in advance how Visa categorizes specific stores.